Margo embraces Godfrey and his mother at the end of a wonderful visit. 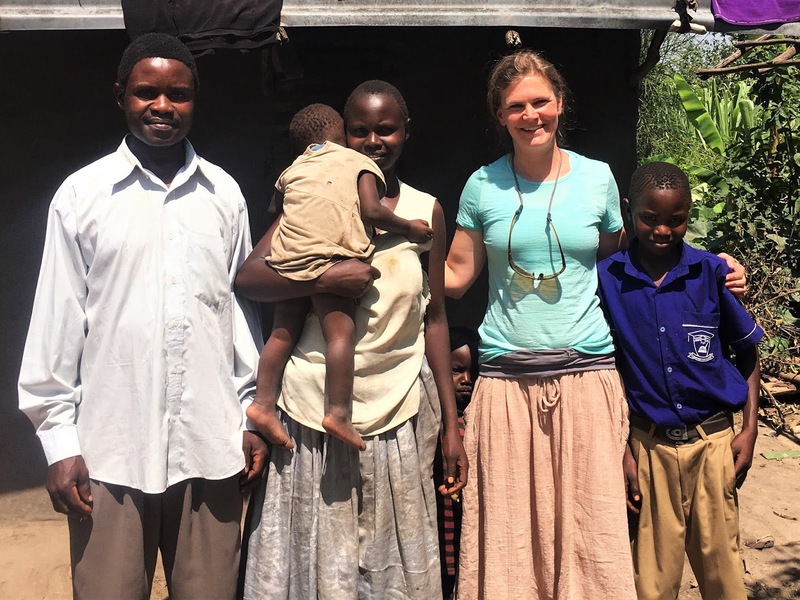 Almost every May since 2005, a team of 10-12 hearty souls from CapChurch in North Vancouver have journeyed to eastern Uganda. Here, team members serve, love, laugh, work, cheer, and re-discover life with new friends half a world away. Dennis Margo was one of those enthusiastic team members in 2017. Here's a first person glimpse into her experience. Do we truly know the meaning of humility? By we, I mean those of us who grew up in Western culture with our basic needs for survival barely registering in our conscious lives and rarely entering our minds even when we devote time to be grateful before God, our Creator and Provider. Rarely have I heard thanks given for clean water that is delivered to us instantaneously. And I had never heard thanks given for technology that allows us to cook without any smoke irritation affecting our eyesight and our respiratory condition—until Nashisa. I didn’t know how humbled I would be by meeting the women who appreciate God’s goodness in such practical provision. One of the wonderful experiences I had occurred on the first day of arrival to the village: the Naming Ceremony. Each visitor receives a name in the local language, Lumasaba. I confess to being a bit nervous about this ceremony. Having grown up in a small rural Canadian town with the name ‘Margo’ in the 70s, I was teased a lot. The refrain that bothered me the most came from a song by folk singer, Stompin’ Tom Connors: “Margo’s got the cargo.” Perhaps a few of you can recall the lyrics—the ‘cargo’ is actually cow dung from Newfoundland, a place almost as far away and foreign to us in Western Canada as Nashisa. I am grateful that my Lumasaba name was not a direct translation of ‘cow dung’ for those of you worried I was heading down that path. The Lumasaba name bestowed upon me after 48 hours of being in Africa was ‘Mwikhoyo’—‘Joy’. The people I met in Uganda taught me about humility and gratitude, but they also taught me about joy: great joy in the faces of those who greeted the strange mzungus (white people) on the bus with song and celebration; great joy in the faces of the children who held our hands and skipped before us; great joy at meeting my sponsored children, Gerald and Godfrey, and their families. Through their joy, these caregivers of Nashisa modeled to me gratitude at God’s provision, humility at the exquisite perfection of his solutions, and God’s own delight in seeing his people in Nashisa leading the way in caring for his creation. Members of CAP Church dance in Bufukhula's graduation celebrations of 2013.